Early this month we launched the new brand identity and logo for Vancia Rent, turning it into Vancia Car Lease. 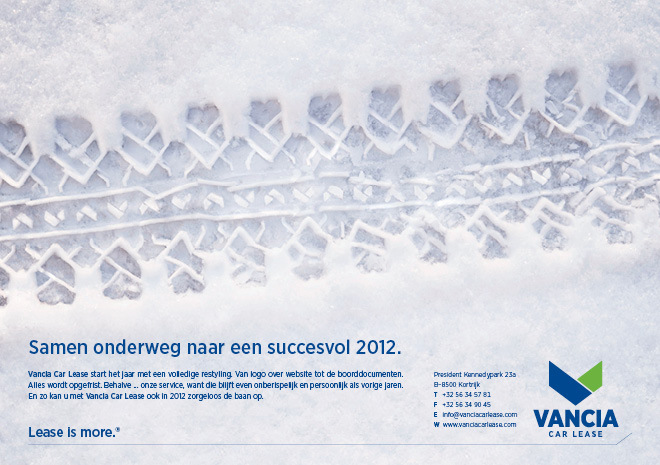 Vancia is one of the top-ten Belgian car lease companies, and is still growing. Integrating the new baseline (Lease is more), we position Vancia Car Lease as a fresh challenger with a focus on service. In a few weeks the new campaign images will appear, but below you can already see the winter print ad. A new website will appear soon as well.